What Else Can I Expect From an Online Bachelor's in Management Information Systems Program? Nearly every organization works with information, technology, and people, making management information systems (MIS) a critical factor in the global economy. According to the Bureau of Labor Statistics, employment for MIS jobs is projected to grow by 15% between 2014 and 2024, which is much faster than the average job growth rate. Whether you are interested in working with nonprofit organizations, large corporations, or other ventures, earning a management information systems bachelor's degree online will help you succeed in the world of business and technology. Below you can find more information about MIS bachelor's degrees, as well as salary expectations and career opportunities for graduates with this degree. MIS programs integrate skills in business, problem-solving, decision-making, data and systems analysis, information technology, and more. The degree prepares you to succeed as a multidisciplinary professional who is able to manage organizations through technology. Most bachelor's in MIS programs require enrolled students to complete general education, core business, and MIS specific coursework. Common courses include database management, behavior in organizations, information technology infrastructure, software design and development, and decision support systems. Many MIS programs will allow you to choose a specialization, allowing you to follow career or personal interests. Common specializations include international business, healthcare management, and communications, but some programs allow students to choose specializations in criminal forensics or cyber security. Most bachelor's in MIS programs are designed to teach students the same basic set of skills, but programs will vary widely in terms of structure and graduation requirements. It's important to ask yourself what you need from a program. The answer to this question will make choosing the right school much easier. Liberty University, a private, nonprofit research university based in Lynchburg, Virginia, is recognized as a powerhouse in online education. The university offers more than 250 online undergraduate, graduate, certificate, and doctoral programs, and serves more than 100,000 online students. The bachelor of science in information systems program is perfect for students interested in the relationship between business and technology. The program holds accreditation from the Accreditation Council for Business Schools and Programs, and includes 120 credit hours of coursework. Students can customize the curriculum to fit their career goals. Learners can choose to specialize in accounting information systems, data networking, databases, or information assurance. With a 100% online format, eight-week courses, and eight start times per year, Liberty University is an excellent place to earn an online MIS degree. Students with prior college experience may transfer in up to 90 credits. Colorado State University-Global is a branch of the state’s university system that focuses exclusively on online learning, providing customizable degrees to fit the needs of individual students. The school’s online bachelor’s in management information systems and business analytics focuses on conducting research and analyzing data to support business decisions, develop solutions, and advance business objectives. This online bachelor’s in MIS program allows students to choose from several specializations, such as criminal forensics, international business, cyber security, or health care management. This program features flexible coursework that is taught asynchronously, monthly term starts, and accelerated eight-week courses. Distance learners are required to complete a total of 120 credits, including 36 credits of general education classes. Students also need to complete a capstone practicum in management information systems and business analytics. In-state and out-of-state distance learners pay the same tuition rate. Dallas Baptist University offers a Christian, community-centered education. All of the university’s online courses are taught asynchronously. Distance courses are divided into weekly sessions and focus on collaborative learning through discussion boards. The university’s online bachelor’s in management information systems is a 120-credit program. Students enrolled in DBU’s online bachelor’s in MIS are required to complete the university’s core requirements, including coursework in English, history, natural science, and religion, as well as 30 hours of MIS-related courses. Major classes include studies in the ethical and human side of information technology and IT security and forensics. Several of DBU’s required courses also incorporate a field-based, service-learning component. Students who have finished at least 24 hours of technical or occupational studies in an MIS-related field can choose to enroll is DBU’s inverted degree program; students in this program can waive the required 42 credit hours of upper-level credits in order to graduate faster. Located in Greenville, North Carolina, East Carolina University was one of the first universities in the country with an online degree program. Today, ECU offers over 90 online degrees and certificates. Classes in the university’s 120-credit bachelor’s in management information systems (MIS) are taught asynchronously, although some have occasional synchronous chat sessions. ECU’s bachelor’s in MIS focuses on the role that computers play in human settings. Students learn a strong foundation in technology, as well as interpersonal and problem-solving skills. The program offers core college courses that emphasize management information systems, including writing for business and industry, philosophy of business ethics, and applied mathematics for decision making. Distance courses are accessible through the Blackboard learning managements system. Applicants must submit either SAT or ACT scores. Transfer credits with a GPA of 2.5 or higher may be accepted. Founded in 1958, Brandman University is a private institution that offers more than 50 degree, certificate, and professional programs. Brandman operates 25 campus locations as well as online programs. The university is dedicated to helping working professionals advance their careers through flexible programs. The BBA in information systems management is available online, and is ideal for students interested in business as well as programming, data communications, and network security. The self-paced curriculum includes general education courses in the humanities and social sciences, as well as specialized courses in computer systems architecture and database systems. The business core includes courses in finance, business law, business strategy, information technology, management, marketing, and supply chain. Students may transfer in prior credits as long as they provide official transcripts from regionally-accredited institutions. For admission, students must have a high school GPA of at least 2.0. Applicants must also pass English and math admissions exams. Ottawa University was founded in 1865 and has since become a leader in adult education. In 1974, the school opened its Kansas City campus focused specifically on educating working professionals. Students interested in IT can work towards a bachelor of arts in management of information systems degree online. The curriculum is made up of 124 credit hours, and includes foundational business courses as well as high-level technology classes. Students begin coursework with an introduction to business principles such as ethics and statistics. Towards the end of the program, students master concepts such as IT infrastructure and systems design. In order to be considered for the program, high school graduates must submit an official transcript, SAT or ACT scores, and a two-page essay. Non-high school graduates are also welcome to apply. These students must achieve at least a 450 on the GED, and must submit SAT or ACT scores if they wish to be considered for scholarships. Based in Albany, New York, Excelsior College has specialized in distance education since it was founded in 1971. Today, the college offers more than 30 distance programs of study across five schools. Excelsior prides itself on the academic rigor of all of its online courses. The school serves more than 32,000 students. The bachelor of science in business in management information systems degree can be completed completely online in an accelerated format. Students can opt for self-paced independent study opportunities. The information systems management degree online includes coursework in systems analysis, a business programming language, and database management. Graduates are able to identify emerging technologies and integrate information systems into business operations. The curriculum is made up of 120 credits. Students can opt for eight-week or 15-week course formats. Excelsior's business programs are accredited by the International Accreditation Council for Business Education. The school grants credit for military experience, workforce training, and professional certifications. Ottawa University is a Christian school that emphasizes “life-friendly” online learning options for nontraditional students. The university has campuses in several locations throughout Arizona, Indiana, Kansas, and Wisconsin and offers classes through on-campus, online, and other learning formats. Its online bachelor’s in management information systems allows students to choose from several concentrations, including communication, economics, finance, leadership, and management. Distance coursework is taught asynchronously. This bachelor’s in MIS consists of 124 credit hours, including foundational business courses and MIS courses like project management and behavior in organizations. The degree also helps students connect with business professionals and engage in internships and study abroad programs. It is recommended that applicants reach out to an enrollment advisor and schedule a professional college advisory session. The university also has a generous transfer policy, allowing students to transfer up to 80 credit hours. Located in North Dakota, Minot State University offers several undergraduate and graduate degrees online. The university’s bachelor’s in management information systems focuses on the design, development, and application of technology in diverse contemporary business environments. Classes in this online program are taught both asynchronously and synchronously. This bachelor’s in MIS degree offers two different career tracks: systems analyst or IT manager. In addition to MIS major requirements, students are required to take a series of core business courses, which include marketing, corporation finance, and accounting. To gain hands-on learning experience and secure prospective job offers, students participate in internships offered through the university or seek their own internship opportunities. Applicants are required to have a minimum GPA of 2.75 and satisfactory SAT or ACT scores. MSU does not have application deadlines for online students, although it is recommended that students apply a month before their program’s start date. LeTourneau University is a private institution that serves students through three campus locations in Texas, as well as through online programs. The school offers more than 85 undergraduate and graduate areas of study in eight disciplines, and serves close to 3,000 students. LeTourneau prides itself on its dedication to Christian values, and all students take courses in biblical literature and theology. Students pursuing the online BS in computer information systems can complete courses at their own pace. The 126-credit curriculum includes 14 major courses and 13 general education courses. Students take courses in operating systems, financial analysis, web development, and networks. The program also includes business courses in project management and financial analysis. Through the online MIS degree's accelerated format, students can complete each course in just five weeks. Typically, students work at their own pace during the week and submit assignments on Sunday nights. Georgia Southern University is a large public research university located in Statesboro. The school is the largest comprehensive university south of Atlanta, and serves a staggering 27,000 students. Students can choose from 142 degree programs offered at three campus locations and online. The bachelor of information technology is available completely online. The program is designed for working IT professionals, parents with small children, active military personnel, and anyone else who may not be able to complete an on-campus program. The MIS online degree features coursework in business intelligence, web software, knowledge discovery and data mining, and IT issues and management. Students choose from one of four concentrations. Before enrolling in this program, students must complete a two-year general education curriculum. Students may transfer up to 90 credit hours of coursework into the program. However, all learners must complete at least 30 credit hours of coursework at the school. In-state and out-of-state students pay the same tuition rate per credit. A Christian liberal arts college affiliated with the California Southern Baptist Convention, CBU serves around 9,000 students annually. The school maintains boasts Educational Service Centers around the state and a distance education program. CBU’s online bachelor of science in computer information technology prepares students to manage technology issues for businesses and other organizations. Emphasizing strategic, organizational, and technology skills, the program examines business and technology issues from a global and Christian perspective. Graduates gain broad technical skills in the evaluation, implementation, diagnosis, and maintenance of computer systems, along with soft skills such as critical thinking, problem-solving, and self-reflection. CBU offers both a fully online and a hybrid program that combines online and evening campus courses. All courses use an accelerated eight-week format, and students can take courses year-round. Instructors deliver most online courses asynchronously with no set login times. The computer information technology core includes 42 credits of courses covering both technology and business topics. Students explore areas including enterprise architecture, database design, web application development, e-commerce systems, and business networking. CBU also requires students to take two Christian-focused courses: overview of the bible and foundations of Christian thought. CBU offers support to online learners, including an enrollment counselor and a student services advisor. Additionally, the Academic Success Center provides online tutoring services, and the Career Services center offers help with resume writing, interview coaching, career assessment, and job search strategies. Ottawa University is a private, liberal arts university affiliated with the Baptist church. In addition to its main residential campus in Kansas, the school operates four adult education centers. The Brookfield, Wisconsin location serves as a hub for its online students in the greater Milwaukee metro area and beyond. The school's bachelor of arts in management of information systems teaches online learners the skills they need to effectively oversee information systems. The curriculum is split evenly between management and technical courses. Students must complete a total of 124 credits to graduate. Classes for the management information systems online degree include information technology infrastructure and methodologies of project development. Towards the end of the program, students must participate in a capstone course that teaches high-level methods for software acquisition, implementation, and review. The program features four available concentrations. Students may also choose from one of 18 minors, including business administration or leadership and management. The school permits students to transfer up to 80 college credits. Washington State University’s global campus offers online degrees with options for personal academic assistance and extracurricular campus experiences through its global connections program. The university’s online bachelor’s in management information systems is the largest MIS program in the Pacific Northwest. This part-time program provides students with strong IT skills and teaches them how to use this knowledge in a business environment. Students pursuing this management information systems bachelor's degree online complete 120 credits, including 34 common requirements and 60 major-related credits. Online coursework emphasizes hands-on experiences in building software applications. To ensure that students are prepared to work in a global marketplace, the program also includes an international experience requirement; students can choose to participate in study abroad experiences, international internships, or other internationally-focused coursework. WSU offers an assured admission program, which guarantees acceptance for applicants who are ranked in the top 10% of their high school class or who have a cumulative GPA of 3.5 or higher. With over 100 online degree and certification programs, Keiser University primarily serves nontraditional learners seeking a career-focused education. Kaiser’s online bachelor’s in management information systems combines flexible, asynchronous coursework with real-world experiences through community organizations and group projects. The online bachelor’s in MIS is a 123-credit program designed to help students find entry-level professional positions. To graduate, students need to complete 51 hours of general education credits and 72 hours of management information systems credits. Major-specific courses include legal and ethical environment of business and international business. Keiser also offers several online and on-campus degrees and courses that are taught exclusively in Spanish, including business and health care programs. Transfer students are required to have a minimum GPA of 2.0 and must complete the final 25% of their program through Keiser. Located in Portales, Eastern New Mexico University was founded in 1927. Today, the school boasts more than 60 options, including 30 online programs. The bachelor of business administration with an emphasis in information systems prepares students for jobs as computer specialists, IT project managers, and network security analysts. Students enrolled in this online program gain access to academic resources designed for distance learners. The school encourages online students to consult with the dedicated distance education librarian and ask for help from the Online Writing Center. The school uses three online platforms: Mediasite, Blackboard, and Collaborate. While some courses allow students to study on their own time, others require online students to engage with on-campus students during class time. This balance of flexibility and interaction makes Eastern New Mexico University a good choice for students pursuing an MIS degree online. Established in 1932, Lewis University is a private Roman Catholic and Lasallian university located in Romeoville, Illinois. The small school offers more than 80 undergraduate majors and programs of study, while boasting a student to faculty ratio of just 13:1. The school is also known for its accelerated online programs, including the information technology BS. Through Lewis's fast-track options, ambitious students can pair this degree with a master's in information security or an MBA. The online MIS degree prepares students for leadership roles in information technology. The program simultaneously teaches students fundamental management strategies and cutting-edge technical skills. Graduates are eligible for industry certifications from CompTIA and PMI. While the program is offered entirely online, students may choose a blended format which includes evening courses. Whatever course structure they pursue, all students at Lewis receive the same one-on-one guidance from faculty. Columbus State University was founded in 1958 as part of the the University System of Georgia. Established as a junior college, the school now serves nearly 8,500 undergraduate, postgraduate, and doctoral students. Columbia State offers around 90 undergraduate and graduate areas of study, and students can take more than 40 degree and certificate programs online. The school is known for its rigorous distance learning programs. The 123-credit online bachelor of science in information technology gives students a broad overview in leadership and communication. The program also introduces learners to the important role that IT plays in business today. Interesting course offerings include customer relationship management, human-computer interaction, and discrete math for IT. Applicants to the online bachelor's in management information systems program must provide SAT and ACT scores. Potential students should have a minimum GPA of 2.5. Transfer students with at least 30 transferable college credit hours must have a GPA of at least 2.0. Mid-American Christian University is a private, liberal arts, Christian university in Oklahoma City. The university focuses on supporting both traditional and nontraditional students through several different degree formats, including online programs and degree-completion programs for transfer students. Its online bachelor’s in management information systems and ethics is a 124-credit program that combines technical training, information management, and ethical business practices. Courses are taught asynchronously in five- or 10-week sessions, and students have the option of completing their degree online, on campus, or in a hybrid format. MACU’s online bachelor’s in MIS typically takes four years to complete, although students with transfer credits can complete this program in 18 months. Transfer students can also receive credit based on professional certification or for expertise and completed exams in their degree field. Applicants to MACU’s MIS program should have a GPA of 3.0 or higher. Located in Nebraska, Bellevue University is a military-friendly, open access institution. The university offers several flexible degree options, including on-campus and online classes, accelerated cohort courses, open online courses, and certificates of completion. 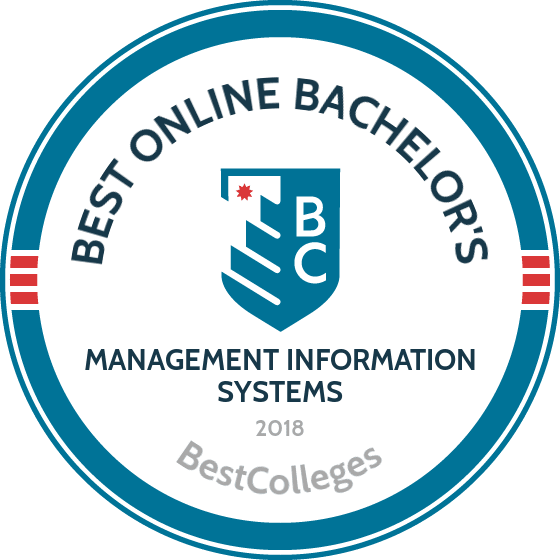 BU’s online bachelor’s in management information systems is offered in an accelerated cohort format where students progress through the program with a tight-knit group of their peers. Students in the MIS program are required to take general education classes, elective credits, major credits, and the university’s Kirkpatrick Signature Series credits, which focuses on the institutions and traditions of western culture and American values. Courses specific to the MIS major include future trends in management information systems and strategic management. To be admitted into this program, applicants should have already earned 60 credit hours at BU (or another institution) or hold an associate degree with three years of work experience in an IT-related field. Located near Washington, DC, George Mason University is Virginia's largest public research university. The school was founded in 1957 with just 17 students; in just 50 years, the school grew to 33,000 students. The university's bachelor of science in information technology is one of more than 50 programs offered online. The program's 120-credit curriculum is delivered asynchronously, meaning that students can watch lectures, participate in discussions, and complete coursework on their own schedule. However, distance learners must still meet weekly deadlines. Notable courses include IT in the global economy, operating systems, and modern telecommunications. Students working toward the MIS degree online can customize their coursework to fit their specific career aspirations. There are five concentrations, including health information technology, web development, and database technology. Students can complete all coursework online except for the capstone requirement. The capstone, a two-semester senior design project, is only offered in a hybrid format. Viterbo University is located in La Crosse, Wisconsin. Its online bachelor’s in organizational management is designed for students with a wide range of technology backgrounds, allowing them to either build on previous experiences or enter the information systems field for the first time. Many graduates of this program continue at Viterbo to earn a master’s of business administration. Students enrolled in this online bachelor’s in MIS program can pursue their degree either part-time or full-time. Viterbo provides a robust support network to its distance learners through the asynchronous online tutoring system Smart Thinking. The university also has a flexible transfer policy; students generally transfer between 60 and 72 credits. Additionally, those who have significant life or work experiences related to their degree can utilize the university’s credit for prior learning program. To qualify for enrollment, transfer students need a minimum GPA of 2.25. Concordia University Chicago is a private liberal arts institution based in River Forest, Illinois. The school is one of 10 colleges and universities that are part of the Concordia University system, a national network of Lutheran colleges. The school boasts a wide array of academic programs and offers more than 60 programs online. Students can complete Concordia's bachelor of science in management information systems degree online in just 16 months. Courses include systems approach to organizational change, programming, and network analysis. At the end of their studies, student demonstrate their knowledge through a capstone project. The program does not require students to be online at any particular time. Major courses take five weeks to complete, while general education courses and electives take five to eight weeks to complete. Applicants must have at least a 2.0 GPA to be considered. Transfer students may apply up to 67 credits towards the degree. Founded in 1899, Azusa Pacific University is a private, evangelical Christian university with eight campus locations throughout southern California. Students at Azusa Pacific can choose from more than 200 online and on-campus undergraduate, graduate, certificate, and professional programs. The BA in management degree with an emphasis in information systems management prepares students for a wide range of leadership roles in the technology industry. This online MIS degree is ideal for students who have a strong interest in business, since the curriculum focuses mainly on management principles and tactics. Notable business courses include entrepreneurship and innovation, statistical analysis for business decisions, and cross-cultural communication. As part of the 120-credit curriculum, students also take five emphasis-specific courses. Azusa Pacific University delivers courses asynchronously through a platform called Sakai. The school expects students to spend about nine hours per week on homework for each three-credit course. Located in Chicago, National Louis University features small class sizes, a diverse student body, and a generous transfer policy. More than 80% of the students at NLU transfer in credits from a community college. The school’s online bachelor’s in management information systems is designed for students who have experience in programming and IT and want to work in management-level positions to develop technology-based systems and solutions. Online courses are taught asynchronously. NLU’s online bachelor’s in MIS requires students to complete 180 credit hours of coursework. Major-specific classes include communications systems, data mining, and warehousing. Students also learn best practices in hiring, managing, and leading IT personnel. Before graduating, distance learners take an MIS capstone course where they analyze real-world business technology issues, design solutions, and plan projects to create business value. Most online MIS programs offer a multidisciplinary education that will qualify you to work in a diverse range of entry-level positions. However, the specific professional opportunities available to you after graduation will vary depending on the program you choose. Below, you can find more information about common classes for an online bachelor's in management information systems program, as well as details about program lengths and accreditation. Coursework will vary depending on which school you choose for your online bachelor's in management information systems. For a general idea of what courses you can expect from this program, a sample curriculum is listed below. Business Information Systems: This course discusses the information needs of managers. Students will learn how to fulfill these needs and how to develop the required information systems. The course prepares students to work as analysts for many types of businesses or for a business consulting firm. Business Software Development: Students learn how to develop computer software for business information processing. They will work with flowcharts, pseudocode, business-oriented programming, online and batch processing, and other technology. Skills learned in this course will prepare students to work as software developers for many businesses and organizations. HOW LONG DOES IT TAKE TO GET AN ONLINE BACHELOR'S IN MANAGEMENT INFORMATION SYSTEMS? A management information systems bachelor's degree online requires students to earn around 120 credits and takes about four years to complete. However, there are many different factors that can affect the length of this program, including whether or not the university offers an accelerated learning program and how many transfer credits the university accepts. Many universities also offer flexible online programs that allow students to start and stop the program as needed in order to work around professional and life events. The length of your online bachelor's in MIS will also depend on whether the program offers individually paced or cohort learning. Programs that feature individually paced learning allow you to proceed through the courses at your own pace, regardless of the pace of other students in the class. Cohort learning has you start at the same time and work through the program at the same pace as a group of peers. The regional and national accrediting process is voluntary and has institutions undergo a rigorous self evaluation and an objective evaluation from outside professionals. The goal of this process is to ensure that the institution offers a quality education that complies with academic standards and that it is committed to continuous growth and improvement. Regional accreditation is more widely recognized. Schools with this accreditation tend to be nonprofit, academic-based private or state schools. National accreditation is performed by a national organization, and schools with this accreditation tend to be for-profit, career-based, distance learning, or religiously-affiliated institutions. Most colleges in the U.S. are regionally accredited. When choosing an online school, it's best to look for regional accreditation, such as the Middle States Association of Colleges and Schools or the Southern Association of Colleges and Schools. The U.S. Department of Education (ED) and the Council for Higher Education Accreditation (CHEA) are great resources for finding out a school's accreditation status. The ED is a federal agency that promotes academic success in American schools by establishing financial aid, ensuring equal access to education, and collecting data. The ED does not directly accredit institutions, it oversees the accreditation system and individual agencies. Similarly, the CHEA oversees accreditation agencies and ensures that these agencies comply with certain standards. For more information about which online bachelor's degrees in MIS are accredited, you can find a list of accredited schools on the DOE's website. According to a recent study from Temple University and the Association for Information Systems, the job placement rate for graduates with a bachelor's in MIS in 2013 was 80%, which was much higher than the national average of 40%. The job placement rate for recent graduates was slightly higher for students with bachelor's degrees in MIS than for those with master's degrees. The following table uses data from this study to show job placement rates for MIS graduates. Keep in mind that the job placement rate for individual students depends on their professional experience and level of success in their program. The MIS field is dynamic and multidisciplinary, preparing graduates for a range of careers. Salaries for employees with a bachelor's in MIS tend to be higher than the average national salary. According to a report from the National Association of Colleges and Employers, MIS majors earned the highest average salaries of 2014 business graduates. The following table shows the median salaries for employees with bachelor's degrees in management information systems according to their specializations. The state where a graduate with a bachelor's in MIS works will also affect their salary. The following table shows data from PayScale regarding the five states with the highest median annual earnings for employees in the MIS field. Earning your online bachelor's in management information systems qualifies you to work in IT, business, web design, system analysis, management, and other fields. Individuals who are successful in these careers are often detail-oriented, organized, analytical, and skilled in interpersonal and management interactions. An online MIS bachelor's degree is also an excellent choice if you are able to multitask. The following list presents a few examples of common jobs for graduates with online MIS degrees. These professionals design and develop computer programs. Many individuals with bachelor's degrees in MIS become software application developers, creating applications that allow businesses and organizations to carry out specific tasks. This type of analyst studies an organization's computer systems and processes, identifies problems and needs within these systems, and develops solutions to help them run more efficiently. Because MIS integrates business and information technology, individuals with a bachelor's in MIS are prepared for this position. Security analysts are responsible for protecting an organization's information. They design and implement security measures for computer networks and systems and understand the IT and business environments. Due to the increased risk of cyberattacks and the business world's evolving technology needs, job growth for information security analysts is much faster than the national average. Database administrators use specialized software to ensure that information is secure and available to authorized users. They work with businesses and organizations to store and organize financial records, shipping information, and other data. Most database administrators have bachelor's degrees in computer or information science and start in a position in a related field before becoming an administrator. These professionals oversee the daily operation of computer networks within a business. Most network and computer systems administrators have a bachelor's degree in computer or information science. Management information systems professionals should have strong interpersonal skills and an understanding of networking and behavior within the business world. Professional MIS organizations help graduates find industry contacts and job opportunities, experience professional growth, and develop leadership skills. Some of the top MIS conferences include the Americas Conference on Information Systems and the International Conference on Information Systems. Below is a list of organization that will help students and graduates. The AIS is a global organization that is committed to creating a community around the information systems field and promoting successful education, scholarship, and career opportunities. The IRMA is an international, nonprofit association that's committed to advancing the concepts and practices of information management in contemporary organizations. IEEE is one of the top authorities on information systems in the fields of aerospace, computers and telecommunications, biomedical engineering, and more. There are several scholarship and grant opportunities for students in the MIS field. Robert Half Technology, the Association of Information Technology, and Boeing offer scholarships for students working in related fields. The FAFSA is also a valuable resource. It will help you understand the scholarships, loans, grants, and work-studies that are available to you. Management information systems is an in-demand field, so there are many funding opportunities available.